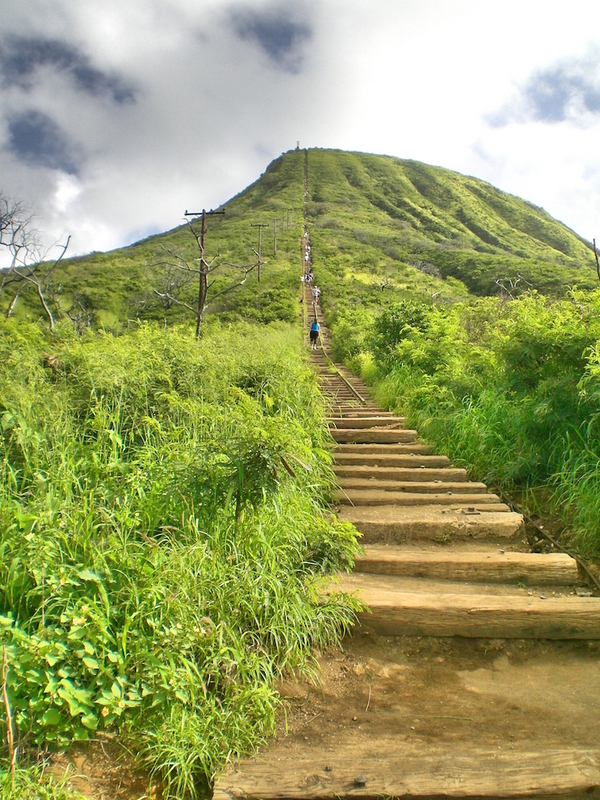 After living in Hawaii for four years and enjoying many spectacular hikes, I always went to a particular hike far more than any other – Koko Head in Hawaii Kai on the island of Oahu, Hawaii. I absolutely loved this hike and it’s one of the trails I miss the most now that I’m not there anymore. Koko Head is actually an old Army lookout station and the trail itself is the remnants of an old railway car system built up the side of the mountain and leading to the old concrete bunkers. In total, there are 1,048 “stairs” up the side of the mountain (the “stairs” are railway ties which still have track attached to them). Every 100 stairs there are markings to indicate how far you have gone. The climb is a fairly intense workout. For the first 500 stairs, things aren’t very steep. Each step is around the height of a normal stair, with the exception of a few spots. I consider this section of the trail my warm-up period. Directly after the first 500 steps there is what everyone commonly refers to as “The Bridge” (pictured to the right). The Bridge is a section of track that is raise about 15 feet from the ground to pass over a small crevasse. Many people are scared of The Bridge. It’s definitely a test of balance, as you’re walking up or down a fairly good slope while stepping over gaps trying to firmly plant your foot on a solid area of the partially rotting railway ties. Over the years, I’ve seen people cry, crawl, and whimper across this section. For those who choose not to brave it, there is also a side trail that allows you to go around The Bridge. If you happen to choose The Bridge and it has just rained, be very careful because it becomes extremely slippery. After The Bridge comes the real workout, as the next 500 stairs become increasingly steep the further you go. This is the part of the trail I love. It’s never easy, but as long as you keep pushing yourself you will make it to the top. And once you plant your foot down after that last step, hopefully you will feel a sense of accomplishment – even if it’s buried deep down within your sweaty, tired, and likely out of breath self. But the fun doesn’t stop there. Once you arrive at the top of the stairs, follow the trail to the right to enjoy a short climb to the very top of the mountain. From the top, you can check out the old Army bunkers, the constantly changing graffiti, and have a seat on some old metal grating while looking out over the ocean. Directly down below is the town of Hawaii Kai. To the left you can see Hanauma Bay, a popular place for snorkeling and checking out sea turtles. To the right, you can see Diamond Head (another popular, but easy hike) and downtown Honolulu. Personally, I recommend going up to watch the sunset over the city. If it’s a Friday night, stay up there until it gets dark; at 7:45pm, you can watch the fireworks go off. But be careful, you may need a flashlight to get back down. On a clear night, my favorite thing to do was to sit up there and look at the stars. It’s a spectacular view from the top, day or night. Length of hike: The trail is roughly 1.2 miles, round-trip. Many people take around 45 minutes to reach the top; my personal goal was always around 30 minutes or less. If you can reach the top in under 20 minutes, you are a pinnacle of fitness. The closest I ever came was 23 minutes. Best time to go: Early morning or late afternoon/evening. Early morning, you can catch the sunrise and get out before it gets too hot. The late afternoon/evening, you can watch the sunset and enjoy the cool evening air. Worst time to go: Between 9am and 4pm the Hawaii sun can become pretty brutal on this trail. The entire trail is open and uncovered, with little to no shade. Once the sun rises in the sky, you will begin to feel the heat and will have a much more difficult climb. I learned the hard way on my first go at Koko Head, reaching the top around 11am. Never again. 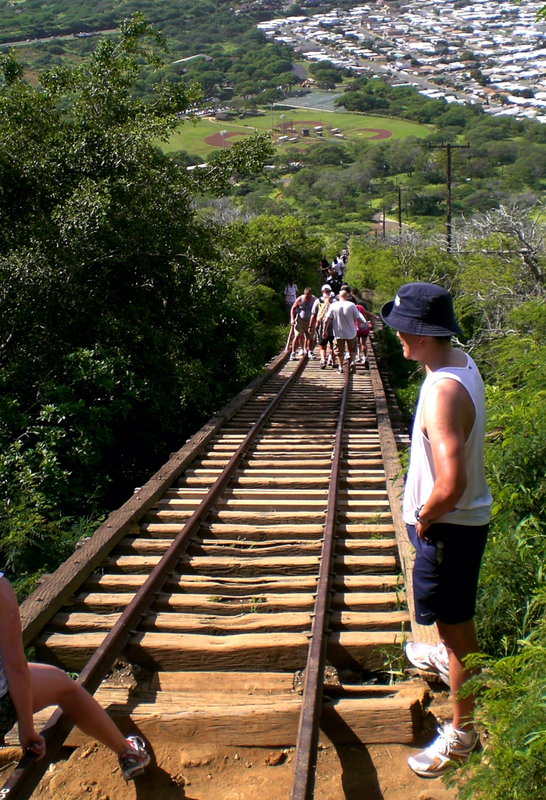 Fun fact: Koko Head is one of only three crater hikes on Oahu. The other two are Diamond Head, which is an easier hike, and Ka’au Crater, which is a significantly more difficult hike due to its length, narrow trails, slippery slopes, and the fact that you have to climb up three waterfalls. If you go to Oahu, I challenge you to do all three crater hikes while there – they are worth it.